Polar Bear Season: Click here to learn more about the "ebbs and flows" of bear viewing each fall. 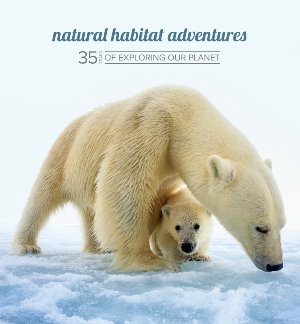 A very important feature of this polar bear adventure is the limited group size. Nature and wildlife are always best experienced in smaller groups, and it is particularly important on this trip so that our guests have plenty of room on board our Polar Rover vehicles during tundra wildlife drives. We limit our group to approximately 29 travelers, and on tundra wildlife drives aboard the Polar Rovers, we generally accommodate 16 guests, leaving plenty of room for you to spread out, store your gear, and move about the Rover to get the best perspectives on the polar bears. Trip price includes: Accommodations in hotels and on our private Tundra Lodge, services of Nat Hab's professional Expedition Leaders and assistants, Polar Rover excursions, dog sledding excursion, evening wildlife and cultural presentations, all meals from dinner on Day 1 through breakfast on final day, some alcoholic beverages, cold-weather gear including a parka and boots during your trip, most gratuities, airport transfers on Day 1 and final day, all activities and entrance fees, all taxes, permits and service fees. Travel to and from the start and end point of your trip, some alcoholic beverages, some gratuities, passport and visa fees (if any), optional activities, items of a personal nature (phone calls, laundry and internet, etc. ), airline baggage fees, airport and departure taxes (if any), optional travel protection and medical evacuation insurance. A stay at our exclusive Tundra Lodge offers guests the true feel of the Far North, with polar bears ambling across the tundra right outside the windows. Despite its isolation, the facility is remarkably comfortable, with private bedrooms and a common lounge. The onboard kitchen staff prepares delectable meals served in the spacious dining room. The specialized Polar Rover vehicle located on site provides transportation for half-day excursions over the tundra. Each Tundra Lodge guest will travel on the Polar Rover for one half-day excursion each day; the second half of each day is spent viewing the bears from the comfort of the Tundra Lodge. As the bears approach us, we are able to observe their interactions in the natural environment surrounding the lodge. An important feature of our polar bear trips is the limited group size. Nature is always best experienced in smaller groups, a particularly important element of this trip. On this unique combination itinerary, we will depart the Tundra Lodge on Day 4 and travel into the town of Churchill to spend two nights, for a chance to experience the culture of this rugged and remote frontier town (sometimes this itinerary will run in reverse). Our polar bear viewing opportunities continue even after we depart the Tundra Lodge, when we return to the tundra from town for an additional full-day Polar Rover excursion on Day 5. Please note that at times, this itinerary may run in reverse with two nights in town, followed by two nights on the Tundra Lodge. Regarding polar bears in general: Polar bears are typically in the Churchill area year-round, though the highest concentration occurs in October and November, as the bears congregate along Hudson Bay waiting for the ice to freeze. Sometimes the best bear viewing happens in the beginning of the season, sometimes it's in the middle, and sometimes at the end—we never know for sure. Once the bay freezes, many of the bears depart. Historically, this typically happens in early December, but an unusually early cold spell can occur to hasten their departure. Fill out the form below to receive additional information about our Tundra Lodge & Town Adventure or give us a call at 800-543-8917.